Use this 1 joule low-impedance electric fence energizer for medium-length temporary fences for livestock and wildlife deterrence. Also for medium-length cattle or horse fence (long fences if there is no weed contact). Energizer Kits: Patriot P10 Plug-in Kit and Patriot P10 Battery Kit are available to help simplify your purchasing decision. 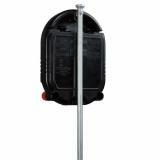 Requires 3 ft of ground rod (To order, see accessories tab above.) in the ground. Draws 4.5 watts per hour if used as a plug-in. Draw from a 12v battery is 87 milliampere (mA) per hour. With this energizer a 12v 100 ampere hour, deep cycle battery will last approximately 28 days* on a clean or a weedy fence. *Assumes being drawn down to 40% between recharges. Use a 10 or 20 watt solar panel. The energizer can be mounted either inside or outside of a building, but not where there is risk of fire. The energizer must be mounted vertically. Protect the energizer from direct rainfall. Was not powerful enough for that kind of fence in west conditions. Did not produce nearly enough shock to prevent a fox from crawling under the fence and getting to our chickens. After one week we have replaced with a different unit. I use electric fence to fence cows from a river and keep deer and raccoons out of my garden. My fence passes through tall grass and willows(often wet with dew) near the river. 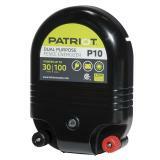 The patriot P10, a marine deep cycle battery and 10 watt solar panel does the job. Best DC system I have ever used.